What does Proc Tabulate do? Proc Tabulate is mainly used to create a professional looking table. 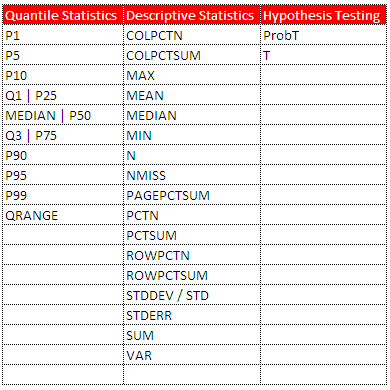 VAR : The Var statement tells SAS that these variables are analysis variables. They must be numeric. They are used to create summary statistics. CLASS : The Class statement tells SAS that these variables are categorical variables. TABLE : The Table statement tells SAS which variables are row expressions, which are column expressions. 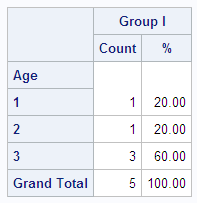 Table Salary; - If there are no commas in the TABLE statement, SAS assumes you are only defining the column expression. Table Gender, Salary; - If there is one comma, then it is a row expression before comma and column expression after comma. By default, it calculates SUM for variables. The asterisk * is used to add statistical keywords. In the TABLE statement, row expression is specified first then followed by comma and then column expression. The "=" equal sign is an operator most commonly used for formatting. The Keylabel statement will change the label of keywords. Both the above programs produce same output. In order to hide variable or labels, you leave the label specification blank (i.e. =‘ ‘ ). The ALL keyword is used to generate a sum total for rows or columns. In order to hide variable or statistic labels, you leave the label specification blank (i.e. =‘ ‘ ). You can use the asterisk * to associate the format modifier “F=” to the summary statistic. 6 Responses to "SAS : Proc Tabulate Explained"
have u got the job ? ?